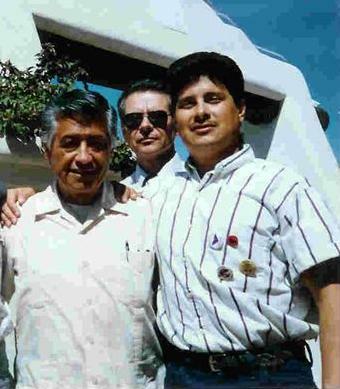 We have been hearing about a forthcoming Cesar Chavez biopic since at least the 1990s, when an El Vez lyric plugged a rumored project by Moctezuma Esparza which never materialized. Today, a mainstream feature film about the legendary Arizonan finally opens nationwide. Predictably, this has brought out the trolls, the same trolls who tell us that Martin Luther King Jr. would support the TEA Party if he were alive today and that Ronald Reagan was the real hero of the civil rights movement. This time, the claim is that Chavez was a registered Republican and a vocal and dedicated opponent of immigration. First, his one-time voter registration is irrelevant. The Republican party of the 1950s and 60s was a very different animal than the one which is familiar to us today, and his political loyalties have to be considered in the context of his contentious relationship with some prominent Democrats like California Governor Pat Brown. His well-recorded support of Democrats like Bobby Kennedy and lifelong work for causes like civil rights and organized labor, however, would seem to imply that his Republican registration was nominal at best. As for his immigration stand, I first heard this one from some of my Republican colleagues as a member of the legislature. As strange as it seems, despite the fact that many people at and around the capitol had actually worked with Chavez, not one of the folks telling me these things bothered to ask around before repeating the talking points. In keeping with my biblical namesake, I would not take their word for it. I called up my former colleague, Representative John Loredo, who had worked with Chavez as a young man, and he helped me get in touch with some folks familiar with the issue. It was no surprise that Chavez’ position on immigration was more nuanced and complicated than my anti-immigrant colleagues would have been willing to concede. Chavez was first and foremost a labor organizer, and anyone familiar with history knows that organized labor in the West has a problematic history with regard to immigration. In Arizona, for example, in the name of protecting unionized workers, nativist elements within organized labor successfully pushed legislation during the early days of statehood that effectively disenfranchised the state’s Mexican-American population for decades. Chavez, at one point in his career, campaigned against illegal immigration, even as his union welcomed the undocumented in its hiring halls. This needs to be considered in context. Chavez’ own organizing efforts, both with the Community Service Organization (CSO) during the 1950s and the United Farm Workers (UFW) from the 1960s onward, included undocumented immigrants, so he clearly did not take issue with immigration in and of itself. His issue was with undocumented immigrants being brought over the border in an effort to break strikes, and with the fact that federal law enforcement turned a blind eye to this even as they targeted other folks who crossed the border illegally. His grievance was with the inconsistency of immigration enforcement, particularly because this hypocrisy conveniently tended to favor the growers who opposed him, and undermined his fight for the dignity of the farmworkers his union represented, including those who were here without papers. Chavez’ stand, and the UFW’s tactics and rhetoric in this regard were, as eloquently reported by former Arizona State Senate Majority Leader Alfredo Gutierrez, controversial among Mexican-American political leaders at the time. Chavez eventually moved on from this crusade, and by the 1980s, his organization, which had already long advocated for the inclusion of the undocumented in the labor movement well before other unions did so, actively supported progressive immigration reforms. The amnesty provision of the Immigration Reform Act of 1986 was passed due in large part to the UFW’s efforts. The film has also been attacked by conservatives for failing to portray Chavez’ activities against illegal immigration. This is about as silly as attacking Moctezuma Esparza’s Gettysburg for failing to show General Hancock’s mediocre performance during Reconstruction. It is beyond the scope of the movie, which takes place before this issue emerged. I guess we can concede one thing to the trolls: the life, work and legacy of Cesar Chavez are much bigger than can be portrayed in any one movie. On the other hand, the dismissive conservative talking points in this regard fail in a much bigger way. The historical facts, as usual, tell a far more complicated story. Thanks Tom. Excellent discussion of the issue, and helpful to people like me who don’t know the details of the UFW history. Great synopsis regarding Chavez’s stand on immigration. I had heard that he was against the guest worker program, which I also oppose. I believe that guest worker programs set us for continuation of the inequitable labor system that we have now, where undocumented workers are scared, exploited, and paid less. My Dad was a Republican and a member of the United Steel Workers in the 1960s.